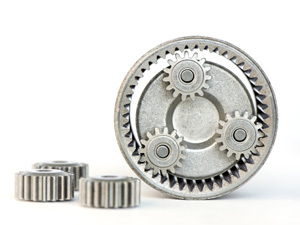 Spur gears are one of the most common types of gear. The gear teeth are straight and can be used to change rotational speed from one shaft to another and/or rotational direction and can offer large gear reductions. Spur gears are generally manufactured either by gear hobbing or gear shaping. Due to their design, spur gears are known as slow speed gears and are noisier than helical type gears. B&F can provide spur gears from 5mm up to 1220mm in diameter and the pitch ranges from 100 DP to 2 DP (0.254 MOD to 12.7 MOD). Spur gears can be finish cut, ground or even shaved.